Even in the dead of summer, even when they could be coasting on the smashing critical success of Say Nothing, even with Brad out of the office floating on a lake in New Hampshire, the interns at BradParksBooks.com never stop working. And so it was that Sarah, the smart intern, began to turn her attention to the future. "Hey," she called out. "What is Brad's next book anyhow?" "It's Closer Than You Know," said Zach, the silly intern. "I'm sure it is. But what's the title?" Sarah asked. "Closer Than You Know," Zach replied. Sarah: "No, no. I'm not asking how soon it comes out. I'm asking what it's called." Zach: "That's what I'm trying to tell you. It's Closer Than You Know." "Okay, you're very excited, I get it," Sarah said, starting to lose her patience. "Now what are the actual words written on the cover?" Sarah stomped her foot loud enough that Peter, the slothful intern, momentarily stirred from his second mid-morning nap. "Darn it, Zach," Sarah snapped. "I've been putting up with your shenanigans for years, and I've never once slugged you. Don't tempt me now. What is. The name. Of. The book?" "You're killing me here. Killing me. Fine. I give up. How soon is it coming out? Oh, oh, let me guess: It's closer than I know." "No, it's March," Zach said. "Finally, we're getting somewhere," Sarah said. "So it comes out in March. And the title is?" It features a young mother, Melanie Barrick, who goes to pick up her infant son from childcare, only to be confronted with the unthinkable: Social Services has taken the baby, and no one will tell her why. Melanie is herself a product of foster care, and so she knows only all too well the horrors of what everyone involved calls "the system"—a place where disaster is always closer than you know. 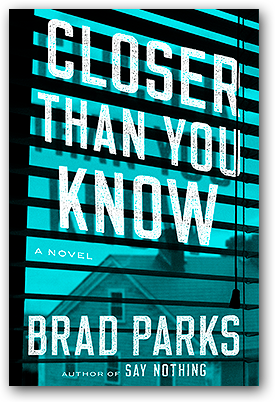 International bestselling author Linwood Barclay has already called it "a compulsive read." And more reviews are expected in the coming months. 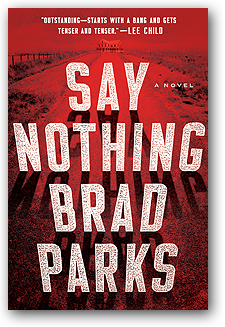 In other news, Inside Jersey magazine named Say Nothing one of its best books of summer, opining it is "a page-turning, way-past-bedtime thriller that should place Parks among the big-name suspense authors." And don't miss Brad and Daniel Palmer's unforgettable serenade of Lee Child at ThrillerFest, which Lee himself later gushed was "a great moment in my life." Meanwhile, Sarah and Zach seemed to finally have things straightened out. "Oh," Sarah said after looking at the screen. "Why didn't you just tell me?"